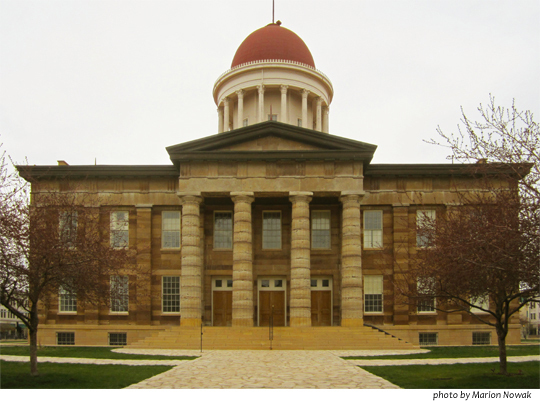 We are just back from a road trip that rolled us around a bunch of the Midwest, including here, the original Illinois capitol building in Springfield. In 1858 in this rough-looking statehouse, Lincoln first delivered his House Divided speech – an unambiguous anti-slavery speech that remains one of the keystones of who we are. One of the things that has struck me about the horrific crime in Boston yesterday is that no one is afraid. We are sad, angry, baffled, but fear? No, nor hysteria, exaggeration, clamor. After the blast, people ran toward it, without hesitation, to help. They ran toward the bloodied pavement and the sobbing mutilated people and the wreckage thrown on top of them. The reactions of even the recent past – hysterical exaggeration, sly bigotry, curious indifference – are not turning up here. There is a stern, powerful calm. We want our social contract back. The roadbed will be hard, and treacherous. But tonight, seeing that great sense of calm, the rampant goodness and decency in the face of evil, the single-minded determination to solve this crime, I have a bit of hope. We shall not fail – if we stand firm, we shall not fail. Wise counsels may accelerate, or mistakes delay it, but, sooner or later, the victory is sure to come. This entry was posted in Uncategorized and tagged Boston, House Divided speech. Bookmark the permalink.